The artist; his son, John Singleton Copley, Jr., Lord Lyndhurst [1772-1863], London; (his sale, Christie, Manson and Woods, London, 5 March 1864, no. 86); bought by "Clarke" for Martha Babcock Greene Amory [Mrs. Charles Amory, 1812-1880], the artist's granddaughter, and her husband, Charles Amory [1808-1898], Boston; purchased 1872 by their daughter, Susan Greene Amory Dexter [1840-1924] and son-in-law, Franklin Gordon Dexter [1824-1903], Boston; their son, Gordon Dexter [1864-1937], Boston; his widow, Isabella Hunnewell Dexter [c.1871-1968]; gift 1942 to NGA. "Clarke" is listed as the purchaser in the annotated copy of Christie's Catalogue of the Very Valuable Collection of Pictures of the Rt. Hon. Lord Lyndhurst, deceased owned by the Boston Atheneum, and by Algernon Graves, Art Sales From Early in the Eighteenth Century to Early in the Twentieth Century, 3 vols. (London, 1908-1921), 1:149; see also Jules David Prown, John Singleton Copley, 2 vols. (Cambridge, Massachusetts, 1966), 2:400, 403. News of the sale appeared in the (Boston) Daily Advertiser 19 March 1864. The initials "CA" in the Atheneum catalogue, noted next to the lot number, indicate that it was purchased for Charles Amory. For the Amorys' dates see John William Linzee, The Linzee Family of Great Britain and the United States of America, 2 vols. (Boston, 1917), 2:766. Martha Babcock Amory, The Domestic and Artistic Life of John Singleton Copley, R.A., (Boston, 1882), 104; Frank W. Bayley, A Sketch of the Life and a List of Some of the Works of John Singleton Copley, (Boston, 1910), 85. Charles Amory wrote Franklin Gordon Dexter on 31 January 1872, "As regard the Red X Knight, we originally bought it to keep, but on buying the Family Picture, thought it putting too much money, for our means, into two pictures and determined to dispose of the first ... to confess the truth to you we neither of us like the idea of selling to our children" (copy in NGA curatorial files). Dexter's 1894 "Memorandum about some of my pictures in 55 Beacon St." states: "The Red Cross Knight by Copley was bought in England by Mr. Charles Amory who sold it to me. The figures are those of Copley's children. 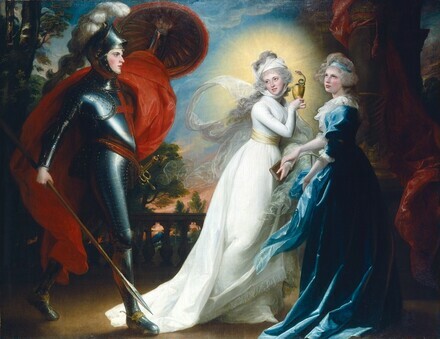 The Knight became in later life Lord High Chancellor Lyndhurst - the woman in white became the wife of Gardiner Greene and consequently the mother of Gordon's grandmother Amory - and the one in blue lived and died Miss Copley. Both were long lived. I have seen both since Gordon was born. Miss Copley I saw in London. I bought the picture when I moved to 55 Beacon St. Mr. Charles Amory's note to me gives some more particulars." For Dexter's dates see Orrando Perry Dexter, Dexter Genealogy, 1642-1904, (New York, 1904), 197; Mrs. Dexter's birthdate is in Linzee 1917, 2:781-782; her death date is in "Proceeding of the New England Historic and Genealogical Society," (meeting of 1 April 1925), The New England Historical and Genealogical Register 74 (July 1925), 325. Frank W. Bayley, The Life and Works of John Singleton Copley, (Boston, 1915), 206; Theodore Bolton and Harry Lorin Binsse, "John Singleton Copley," The Antiquarian 15 (December 1930), 116; Dexter is listed in Who Was Who in America, vol.1, 1897-1942 (Chicago, 1966), 320. Edgar P. Richardson, "The Recent Acquisitions: The Red Cross Knight by Copley," ArtQ 5, no. 3 (Summer 1942), 267-268. Mrs. Dexter died in New York City at the age of 97 (obituary, The New York Times, 16 December 1968, 47). Royal Academy of Arts, London, 1793, no. 75. John Singleton Copley, 1738-1815, National Gallery of Art, Washington, D.C.; Metropolitan Museum of Art, New York; Museum of Fine Arts, Boston, 1965-1966, no. 90. John Singleton Copley in England, National Gallery of Art, Washington, D.C.; Museum of Fine Arts, Houston, 1995-1996, no. 38, repro. "Exhibition of Pictures", Times (London), 30 April, 1793: 4. "Royal Academy. A Review of the Exhibition, 1793. No. II", London Recorder, or Sunday Gazette, 5 May, 1793: 4..
"Royal Academy." London Chronicle (27-30 April 1793): 412. "Royal Academy. Names of the Persons whom the Portraits represent." Public Advertiser (2 May 1793): 4. "Royal Academy." Public Advertiser (30 April 1793): 2. "Royal Academy." True Briton (1 May 1793): 3. "The Royal Academy." True Briton (29 April 1793): 2. "The Twenty-Fifth Exhibition of the Royal Academy", The Morning Herald, 30 April 1793: 2. Tuckerman, Henry T. Book of the Artists. New York, 1867: 79. Perkins, Augustus Thorndike. A Sketch of the Life and a List of Some of the Works of John Singleton Copley. Boston, 1873: 83, 98-99, 133. Amory, Martha Babcock. The Domestic and Artistic Life of John Singleton Copley, R.A.. Boston, 1882: 75, 104, 453-455. Bayley, Frank W. A Sketch of the Life and a List of Some of the Works of John Singleton Copley. Boston, 1910: 85. Bayley, Frank W. The Life and Works of John Singleton Copley. Boston, 1915: 32, 35-36, 170, 205-206. Swan, Mable Munson. The Atnenaeum Gallery 1827-1873. Boston, 1940: 108-109. Richardson, Edgar P., "The Recent Acquisitions: The Red Cross Knight by Copley," ArtQ 5, no. 3 (Summer 1942): 267-268. Richardson, Edgar P. Painting in America: The Story of 450 Years. New York, 1956: 143. Bouton, Margaret. American Painting in the National Gallery of Art. Washington, D.C., 1959 (Booklet Number One in Ten Schools of Painting in the National Gallery of Art, Washington, D.C.): 14, color repro. Walker, John. National Gallery of Art, Washington, D.C. New York, 1963 (reprinted 1964 in French, German, and Spanish): 320, repro. John Singleton Copley, 1738-1815, Exh. cat. National Gallery of Art, Washington; Metropolitan Museum of Art, New York; Museum of Fine Arts, Boston, 1965-1966: no. 90. Prown, Jules David. John Singleton Copley, vol. 2. Cambridge, MA: Harvard University Press, 1966, pp. 342, 388, 403, 445. Walker, John. National Gallery of Art, Washington. New York, 1975: 394, fig. 569, color repro. Bradley, Laurel. "Eighteenth-Century Paintings and Illustrations of Spenser's Faerie Queene: A Study in Taste." Marsyas 20 (1980): 42. Perkins, Robert F. and William J. Gavin III. The Boston Athenaeum Art Exhibition Index, 1827-1874. Boston, 1980: 41, 288-289. Williams, William James. A Heritage of American Paintings from the National Gallery of Art. New York, 1981: 31, repro. 28-29. Walker, John. National Gallery of Art, Washington. Rev. ed. New York, 1984: 390, no. 554, color repro. American Paintings: An Illustrated Catalogue. National Gallery of Art, Washington, 1992: 151, repro. John Singleton Copley in England. Exh. cat. National Gallery of Art, Washington; The Museum of Fine Arts, Houston, 1995-1996: no. 38. Kramer, Hilton. "Copley's Decline." Art & Antiques (December 1995): 92-93, repro. Miles, Ellen G. American Paintings of the Eighteenth Century. The Collections of the National Gallery of Art Systematic Catalogue. Washington, D.C., 1995: 76-81, repro. 79. Kirsh, Andrea, and Rustin S. Levenson. Seeing Through Paintings: Physical Examination in Art Historical Studies. Materials and Meaning in the Fine Arts 1. New Haven, 2000: 155, 158, fig. 156, color fig. 157.